Sparkling Ice is good on ice, but it’s GREAT in recipes too. Here are five of our favorites. 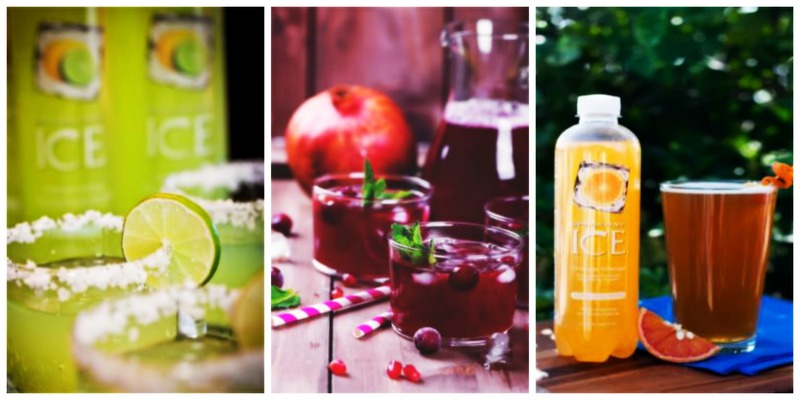 Our friends at Sparkling Ice know how to do bubbly and refreshing beverages without a ton of calories. Zero calories, actually. Believe it or not, they’re also really great in entrees and desserts too! Even if you’re just sticking with the refreshing bubbly drink over ice, you’re in luck as well. Starting Wednesday, June 21, we’ve got a deal that gives you a free bag of Festival Foods ice when you buy a 12 pack of Sparkling Ice. Directions: Combine all ingredients in a shaker with ice. Shake and strain into a chilled rocks glass rimmed with salt. Garnish with a lime slice. Directions: To prepare the marinade, whisk together Sparkling Ice Cherry Limeade, soy sauce, garlic, ginger, whole peppercorns, red pepper flake and olive oil in a large bowl. Place pork tenderloin in a large zip lock bag or shallow baking dish. Pour marinade over pork, cover or seal. Refrigerate for 6 hours. Remove pork from marinade and pat dry. Season both sides with salt and pepper. Reserve the liquid. Place marinade in small saucepan and bring to a boil. Turn heat to low and simmer for 15-20 minutes. Preheat your grill (medium high heat). Place pork on pre-heated grill and close the cover. Turn and brush the pork with the simmered marinade every 5 minutes. Cook until meat thermometer inserted into the thickest part of the pork registers 145°F, about 15-20 minutes. Rest for 10 minutes, slice and serve with scallions and warm marinade liquid. Directions: Add Cherry Limeade Sparkling Ice to medium saucepan. Bring to boil and reduce liquid by less half, about ¾ cup. Add cherries, shallots and spices. Bring to boil. Reduce heat to medium and slow boil for 20 minutes until fruit is tender and liquid reduces further. Allow to cool for 30 minutes. Transfer to blender. Blend until smooth. Directions for the crumble: Combine brown sugar and flour in a mixing bowl, and cut in the butter with your hands. Mixture should look coarse with some chunks the size of peas. Cover and place in the refrigerator for 30 minutes to harden up. Preheat oven to 350 degrees. Line a baking sheet with parchment paper and pour on the crumble. Bake for 12-18 minutes or until light brown. Place baking tray on a wire rack to cool. Directions for the apples: Core and cube the apples and place in a large bowl of cold water to avoid browning. Whisk together the cornstarch with Sparkling ICE in a small mixing bowl, set aside. In a medium saucepan melt 2 tablespoons of the butter. Add the apples, salt, and cinnamon. Sautee over a medium flame for 3 minutes. Pour the Sparkling Ice and cornstarch mixture into the pot, stirring continuously. Simmer for 5 minutes. Turn off the heat and stir in the remaining tablespoon of butter. Assembly: Break the cooled crumble up with your hands to desired size. Scoop the warm apples into 6 small ramekins or an 8 inch square serving dish. Top with crumble. Serve immediately. Directions: In a large pitcher, combine Sparkling Ice Pomegranate Blueberry, pear nectar, and orange-flavored liqueur. Slowly add Champagne. Serve over ice. Garnish with mint and blueberries.